Download "U.S. News Best Lawyers "Best Law Firms" Publicizing Guidelines"
1 U.S. News yers " Firms" Publicizing Guidelines U.S. News & World Report ("U.S. News") and Woodward/White (dba as "yers") permits ranked law firm (the "Law Firm") to mention their rankings as specified below: To be eligible to mention that it has been ranked in the 2015 Firms rankings, the Law Firm must appear in the print or online version of the Firms 2015 list. The Law Firm must prominently specify whether the ranking is a National or Metro designation, the specialty, and tier when mentioning its 2015 Firms rankings. The 2015 Firms rankings shall only be used for the purpose of identifying the Law Firm as having been named to the Firms 2015 list and not to imply an endorsement of any products or services. 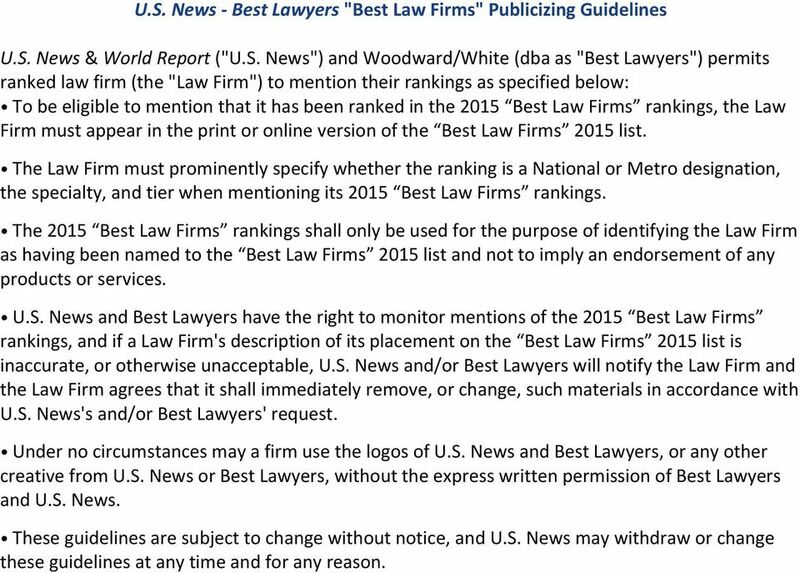 U.S. News and yers have the right to monitor mentions of the 2015 Firms rankings, and if a Law Firm's description of its placement on the Firms 2015 list is inaccurate, or otherwise unacceptable, U.S. News and/or yers will notify the Law Firm and the Law Firm agrees that it shall immediately remove, or change, such materials in accordance with U.S. News's and/or yers' request. Under no circumstances may a firm use the logos of U.S. News and yers, or any other creative from U.S. News or yers, without the express written permission of yers and U.S. News. These guidelines are subject to change without notice, and U.S. News may withdraw or change these guidelines at any time and for any reason. 2 U.S. News yers " Firms" Customized Badges BEST LAW FIRMS BADGE USAGE GUIDELINES U.S. News & World Report ("U.S. News" ") and Woodward/White (dba as yers ) has licensed to your ranked law firm (the "Law Firm" ) a graphic (the "2015 Firms Badge" or Badge ) to be used as permitted under these Guidelines. To be eligible to use the 2015 Firms Badge, the Law Firm must appear in the print or online version of the Firms 2015 list. Law Firm acknowledges that the license made hereunder will in no way affect, positively or negatively, the ranking of the Law Firm. The 2015 Firms Badge shall only be used by the ranked Law Firm named to the Firms list, and may not be used by any parent, subsidiary, related or affiliated institutions. 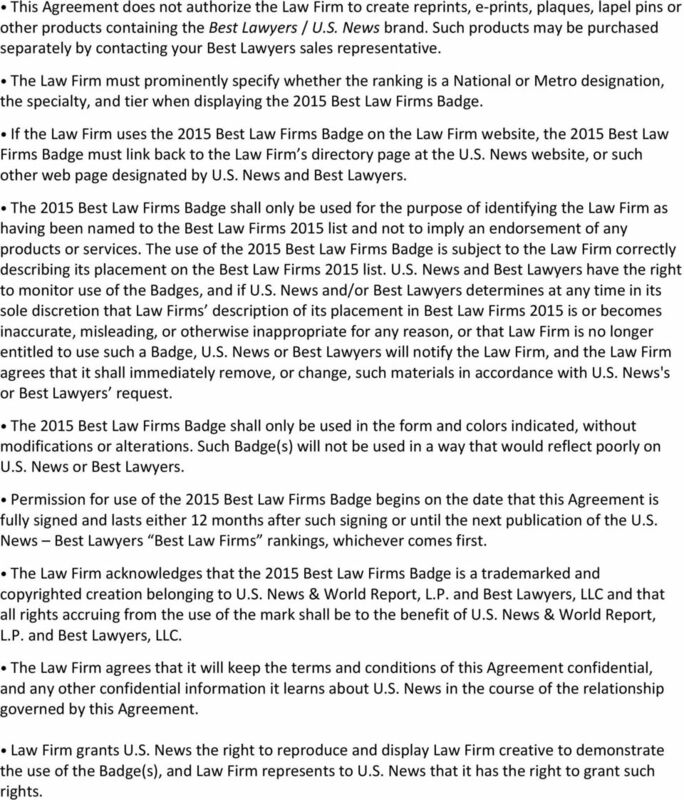 A Law Firm that has licensed the 2015 Firms Badge may use the 2015 Firms Badge as follows: o On its website. o On the footer of e mail messages originating from the firm. o In print or online marketing presentations for limited distribution. o In marketing brochures for limited distribution. o In print and online advertising (excluding billboards and other forms of outdoor advertisements, yellow page advertisements and television), providedd that such advertising must be provided to yers for its approval prior to production. While the 2015 Best Law Firms Badge may appear on the Law Firm s website, it may not be placed on social media web sites or any other web sites on which the Law Firm may have a presence. In no event will U.S. News/ yers permit an advertisement to state that a ranked law firm is a best law firm or to suggest that a listing in U..S. News yers Best Law Firms guarantees a desired result in a legal case or that their lawyers are necessarily more skilled than lawyers at firms that are not ranked in the publication. 3 This Agreement does not authorize the Law Firm to create reprints, e prints, plaques, lapel pins or other products containing the yers / U.S. News brand. Such products may be purchased separately by contacting your yers sales representative. The Law Firm must prominently specify whether the ranking is a National or Metro designation, the specialty, and tier when displaying the 2015 Firms Badge. If the Law Firm uses the 2015 Firms Badge on the Law Firm website, the 2015 Firms Badge must link back to the Law Firm s directory page at the U.S. News website, or such other web page designated by U.S. News and yers. The 2015 Firms Badge shall only be used for the purpose of identifying the Law Firm as having been named to the Firms 2015 list and not to imply an endorsement of any products or services. 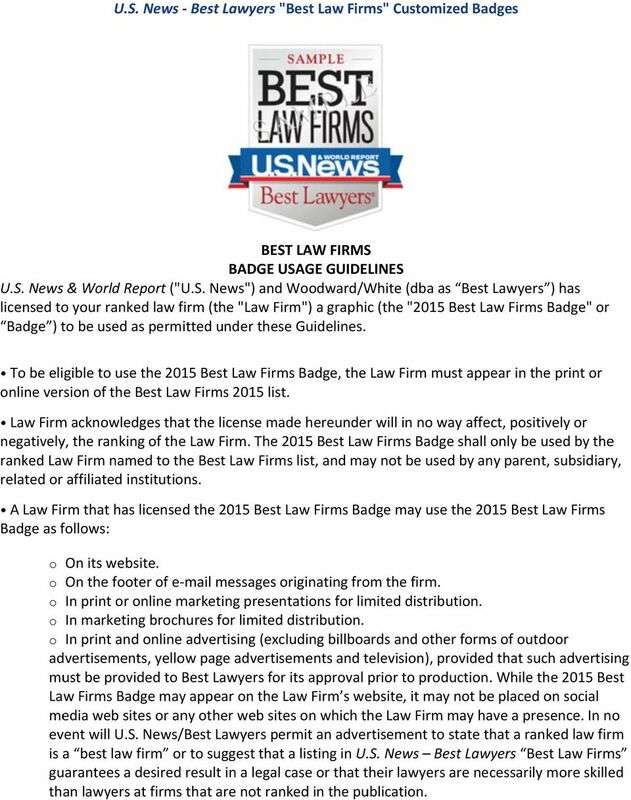 The use of the 2015 Firms Badge is subject to the Law Firm correctly describing its placement on the Firms 2015 list. U.S. News and yers have the right to monitor use of the Badges, and if U.S. News and/or yers determines at any time in its sole discretion that Law Firms description of its placement in Firms 2015 is or becomes inaccurate, misleading, or otherwise inappropriate for any reason, or that Law Firm is no longer entitled to use such a Badge, U.S. News or yers will notify the Law Firm, and the Law Firm agrees that it shall immediately remove, or change, such materials in accordance with U.S. News's or yers request. The 2015 Firms Badge shall only be used in the form and colors indicated, without modifications or alterations. Such Badge(s) will not be used in a way that would reflect poorly on U.S. News or yers. Permission for use of the 2015 Firms Badge begins on the date that this Agreement is fully signed and lasts either 12 months after such signing or until the next publication of the U.S. News yers Firms rankings, whichever comes first. The Law Firm acknowledges that the 2015 Firms Badge is a trademarked and copyrighted creation belonging to U.S. News & World Report, L.P. and yers, LLC and that all rights accruing from the use of the mark shall be to the benefit of U.S. News & World Report, L.P. and yers, LLC. The Law Firm agrees that it will keep the terms and conditions of this Agreement confidential, and any other confidential information it learns about U.S. News in the course of the relationship governed by this Agreement. Law Firm grants U.S. News the right to reproduce and display Law Firm creative to demonstrate the use of the Badge(s), and Law Firm represents to U.S. News that it has the right to grant such rights. 4 Law Firm shall indemnify, defend and hold U.S. News and yers, and their parents, subsidiaries, and affiliated and related companies, and the directors, officers, employees, agents and representatives of each of them (the Indemnified Parties ) from and against, any and all liabilities, obligations, demands, causes of action, claims, judgments, settlements, losses, damages, injuries, costs or expenses ( Losses ), relating either directly or indirectly to, or arising from, Law Firm s breach of this Agreement, Law Firm s use of the Badge(s), the purchase and/or use of the Law Firm s products or services by one or more consumers or customers, and/or the Law Firm s business, activities, products, and operations, including but not limited to programs and services advertised by Law Firm using the Badge(s). U.S. News and yers shall, at their option, control on behalf of the Indemnified Parties the defense or settlement of any third party claim, or have Law Firm control the defense or settlement, using counsel approved in writing by U.S. News and yers. In either case, Law Firm, as the indemnifying party, shall bear all costs and expenses of the defense or settlement (including, without limitation, reasonable attorney s fees, costs and expenses) as and when they are incurred. In the event that Law Firm shall have control of the defense or settlement of a third party claim, the Indemnified Parties shall have the right to participate in such defense or settlement with counsel of U.S. News s and yers choosing. To the extent Law Firm controls the defense or settlement of any third party claim, Law Firm shall make no settlement without the written consent of U.S. News and yers. U.S. NEWS AND BEST LAWYERS MAKE NO WARRANTIES, EXPRESS, IMPLIED OR ARISING BY CUSTOM OR TRADE USAGE HEREUNDER (INCLUDING WITH REGARD TO THE BEST LAWYERS 2015 BADGE) AND, SPECIFICALLY, MAKE NO WARRANTY OF ADEQUACY, MERCHANTABILITY, OR FITNESS FOR ANY PARTICULAR PURPOSE. THE LIABILITY OF U.S. NEWS, BEST LAWYERS, OR THEIR RESPECTIVE PARENTS, SUBSIDIARIES, AND AFFILIATED AND RELATED COMPANIES, AND THE DIRECTORS, OFFICERS, EMPLOYEES, AGENTS AND REPRESENTATIVES OF EACH OF THEM, FOR ANY ACT, ERROR, OR OMISSION FOR WHICH THEY MAY BE HELD LEGALLY RESPONSIBLE SHALL NOT EXCEED THE AMOUNT PAID BY THE LAW FIRM UNDER THIS AGREEMENT. U.S. NEWS AND BEST LAWYERS SHALL HAVE NO LIABILITY FOR CONSEQUENTIAL, SPECIAL, OR PUNITIVE DAMAGES HEREUNDER, INCLUDING BUT NOT LIMITED TO THE COSTS OF DESIGNING, PRODUCING AND DISTRIBUTING LAW FIRM S ADVERTISING AND MARKETING MATERIALS. Law Firm agrees to be bound by the terms of this contract. 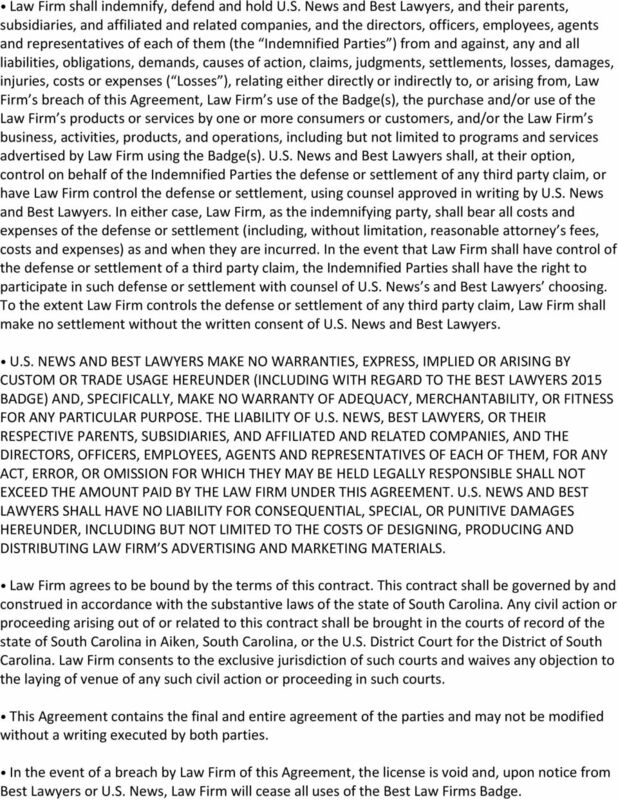 This contract shall be governed by and construed in accordance with the substantive laws of the state of South Carolina. Any civil action or proceeding arising out of or related to this contract shall be brought in the courts of record of the state of South Carolina in Aiken, South Carolina, or the U.S. District Court for the District of South Carolina. Law Firm consents to the exclusive jurisdiction of such courts and waives any objection to the laying of venue of any such civil action or proceeding in such courts. This Agreement contains the final and entire agreement of the parties and may not be modified without a writing executed by both parties. In the event of a breach by Law Firm of this Agreement, the license is void and, upon notice from yers or U.S. News, Law Firm will cease all uses of the Firms Badge. 5 Except as set forth herein, no other use of the 2015 Firms Badge may be made without U.S. News's and/or yers s prior express approval. U.S. News & World Report is a registered trademark of U.S. News & World Report, L.P. Best Lawyers is a registered trademark of Woodward/White, Inc. The name, logo and Firms database are protected under the trademark and copyright laws of the United States of America. Any use of same, including in electronic form, must be made only by permission and under the guidelines of U.S. News and Woodward/White, Inc. Affiliate Agreement. No one is eligible to join the Affiliate Partner Program in order to receive a commission on Software purchased by them. Zander Identity Theft Solutions Benefits Summary and Terms of Service Introduction This Benefits Description contains the terms and conditions of your benefits coverage with Zander Identity Theft Solutions. THIS MASTER SUBSCRIPTION AGREEMENT AND THE ORDER FORM (DEFINED BELOW) GOVERN THE USAGE OF THE GSHIFT SUITE OF TOOLS.